The only interest that Oxford Professor Charles Meredith has in the diaries is as a record of Hungarian folklore … until he comes face to face with a myth. But Hannah knows that if her daughter is ever going to be safe, she will have to stop running and face the terror that has hunted her family for five generations. And nothing in the diaries can prepare her for that. When this came out and the glowing reviews started appearing everywhere, I almost bought a hardback copy. That’s how much I wanted to read it. I didn’t quite get round to doing that and now? I’m a little bit glad. 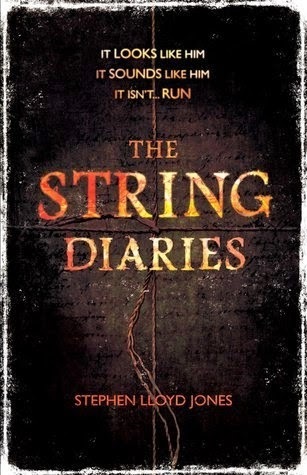 I enjoyed the vast majority of The String Diaries but there was something…missing that stopped me from loving it. The book starts by dropping right in on the action, with Hannah and her husband and daughter on the run from whatever is trying to kill them all. It’s a strong pace that never really lets up so this is a good one to get stuck into if you want to get well and truly caught up in some drama. In short, Hannah is on the run from Jakab, a shapechanging bundle of malevolence whose only purpose in life is wreaking violent havoc on Hannah’s family. A member of the ancient Hungarian Hosszu Eletek, Jakab can shift his shape to look and sound like anybody he wants and has centuries of experience of blending in amongst friends and family to home in on his victims. It and he is genuinely creepy and weaves tension through even the more mundane conversations. The idea of ‘validating’ friends and family and exchanging secrets to trade when under pressure works well, even if it is a little overdone by the end. The Hungarian mythological feel is distinctive and there’s something quite nice about reading a standalone fantasy novel. For a book that barely tops 400 pages, there’s a surprising amount of depth too. It was refreshing to read about a culture and history that was based on Eastern European tradition but I think more could have been made out of it – I wanted more of the medieval-esque social rituals and history and more about what the shapechangers’s history and what they could do. The age-old dispute that the story is based on draws on some clever ideas and manages to throw up plenty of action (some of it quite horrific) but the modern thread is less unique. Not that it isn’t engaging (because it is) but it doesn’t have the charm that the historic plot does and I would have liked more of the back story and less of the scrambling present day. That’s more my personal preference (and maybe a hangover from generally loving historical fiction and fantasy with books’ worth of background) than a criticism, though. But then came the ending. If the book had stopped after what I thought was the ending, I’d have given this a solid four stars but I was really disappointed that a wonderful ending was diluted to something that was, quite frankly, tepid. The bulk of the story doesn’t shy away from some more traumatic turns and I like it when an author is brave enough to kill people off. This story was relying heavily on a pervasive sense of danger that just wouldn’t have worked without a few darker moments. I don’t want to spoil anything so I’ll stop grumbling but things fell flat for me. And those of you that aren’t epilogue fans will not be converted by The String Diaries’. Naff. Overall: If you’re looking for a relatively quick, action-packed fantasy hit, The String Diaries could be right up your street. It’s a bit of a mixed bag but it’s a good, definitely adult novel. If you’re used to ingesting your fantasy in series form, you might find it a little bit lacking in character development but you could do worse if you fancy a break from frustrating cliff-hanger endings. Source: Received from the publisher via NetGalley – thanks, Headline!